What’s odd with this picture? Did you see it right away? 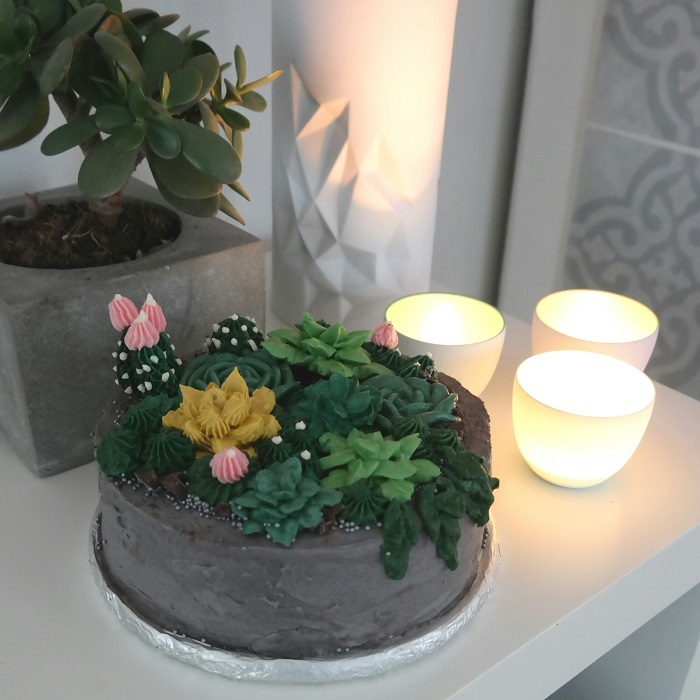 Yes, the planter with the succulents is actually a cake. With the regular piping techniques, I got wonderful succulents and cacti. 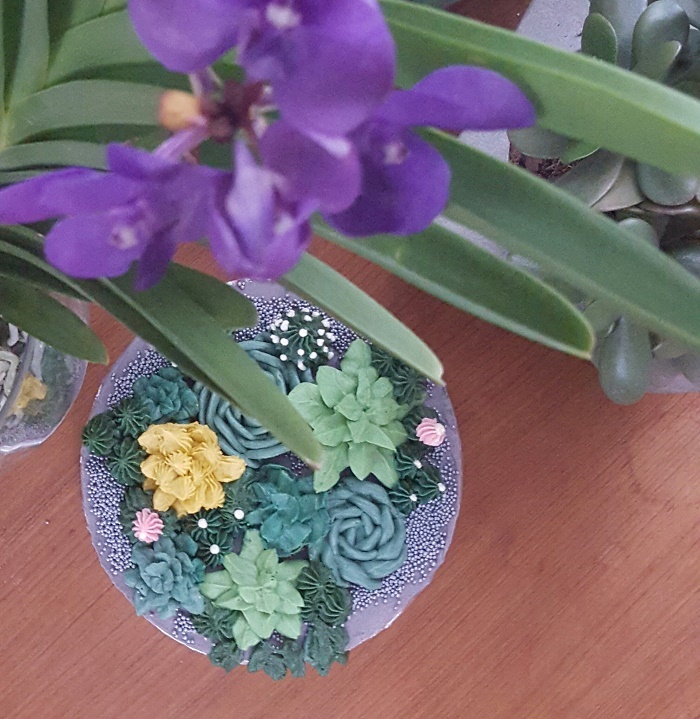 This is actually the first time I make succulents and cacti, but I have piped other flowers before. The cake it self I roughly covered with grey butter cream, to resemble concrete. I mixed different colors of green and a few others like pink and yellow. Then I piped the succulentish figures, these below I have used leaf and petal tip. The petal tip I faced the larger rounded end upwards and used the same technique as to pipe a rose. Pipe your succulents using a piping nail, stick a piece of baking paper on the top of your piping nail, use a little bit of the frosting as glue, pipe a succulent and place it on a cookie sheet. Make the amount you want to use and put it somewhere cool, the butter wil harden and so much easier to place them on the cake later. 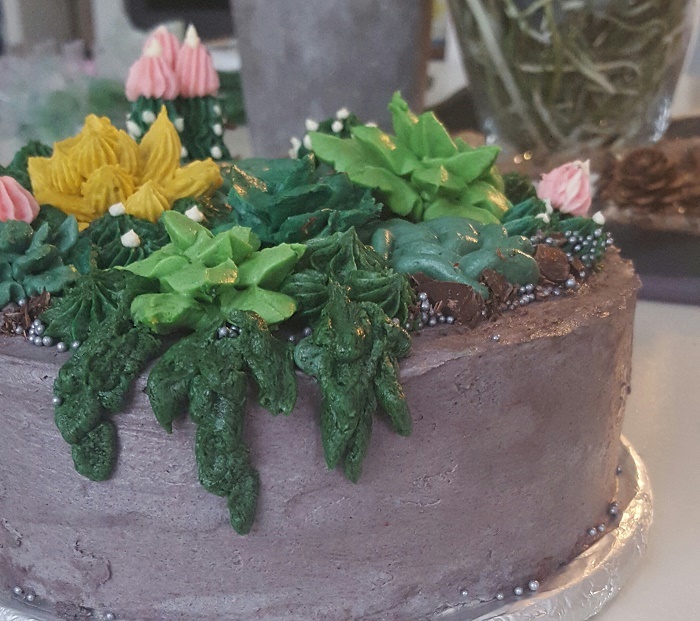 Place your succulents on your cake and pipe a cactus where you want to fill a gap. 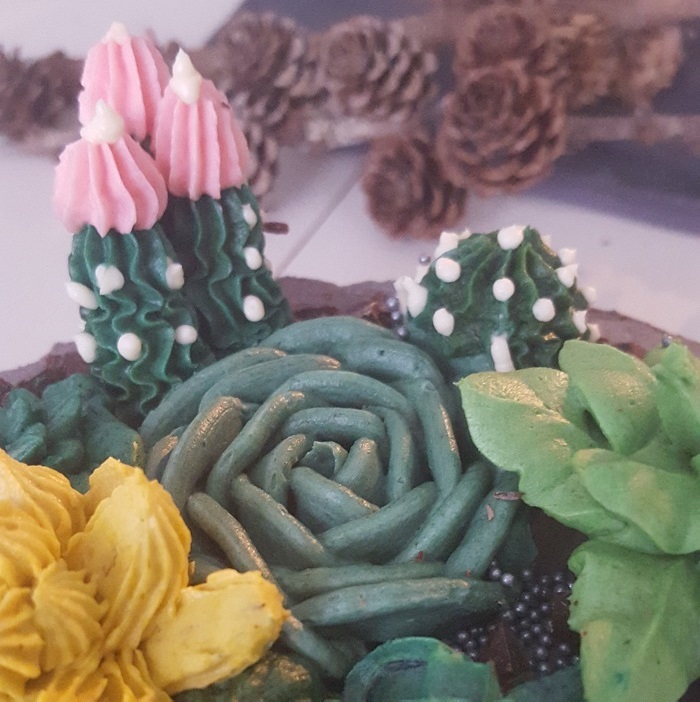 Use an open star tip for piping mini cacti and pipe some pink frosting on some, just to make a different type of cactus. Like I said it is the first time I make one of these, hope you liked it. 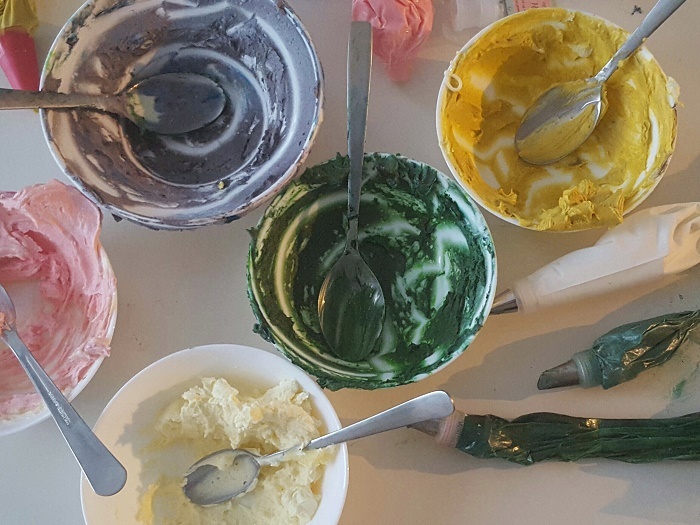 Use your favorite butter cream and favorite cake to make your faux planter with faux succulents and cacti. Combine flour and milk in a saucepan and whisk to a lump free mixture before you start heating it up. Heat up the mixture to an almost boil and stir all the time so it won’t stick and burn, when the flour is cooked this becomes a velvety smooth pudding. Remove from heat and let it cool. I usually transfer this mixture to another bowl and cover it fit cling film, making sure the cling film touches the porridge, this way you wont get any surface film. While waiting for the porridge to cool(remember that if you use it when it is to warm it can melt the butter cream). Beat butter, powdered sugar and vanilla extract on medium speed to normal butter cream. When the milk and flour mixture is cool enough to be used, add it little by little into the butter cream, you will get a light and fluffy cream.